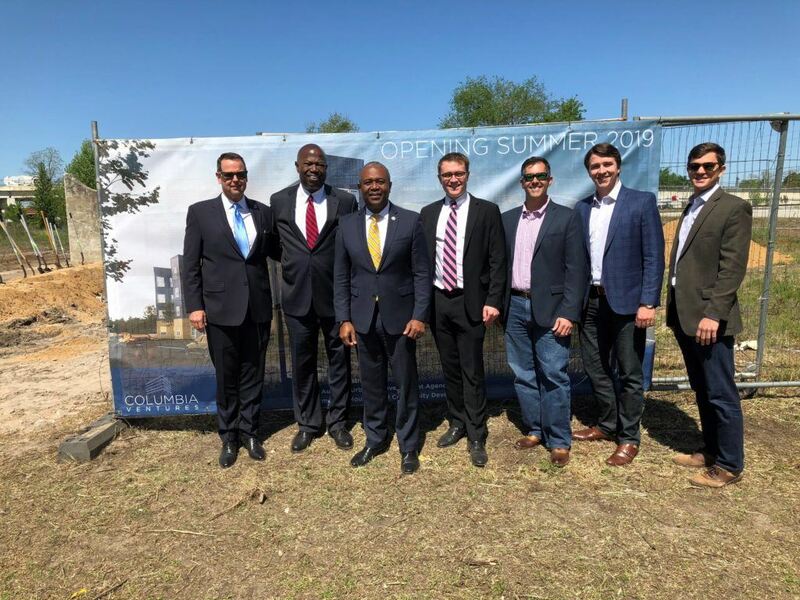 (ATLANTA – May 10th, 2018) – The RADCO Companies (RADCO), one of the nation’s leading opportunistic real estate developers, gathered with Columbia Ventures and city officials to celebrate the groundbreaking of The Foundry in Augusta, Georgia. In partnership with Columbia Ventures, The Foundry provides a unique, joint venture opportunity for RADCO Capital (the equity fundraising arm of RADCO) to contribute $5.28 million of private equity capital for a new build, Class A asset that will add value to an underserved market. The Foundry is currently under construction and scheduled to welcome residents in Summer 2019. The 221-unit garden-style apartment complex will consist of one-, two-, and three-bedroom layouts within one elevator-served building and five walk-up buildings situated across more than 7 acres. The spacious floorplans will average 996 square feet per unit and include 9’ ceilings, granite counter tops, stainless steel appliances, balconies, and washer/dryers. The Foundry’s amenity package will include a resort-style swimming pool, outdoor kitchen area, dog park, clubhouse, fitness center, study lounge, automated package management, valet trash service, and electric vehicle charging stations. The Foundry will also be home to Augusta’s only onsite ZipCar sharing service. “We are humbled to be a part of the redevelopment story of the Laney Walker/Bethlehem community. We could not have found a better capital partner with an aligned view towards long-term investment in Augusta,” said Noel Khalil, Columbia Chairman. Nestled in the heart of Augusta’s Medical District, The Foundry will be located within walking distance to Augusta University’s Student Center. The university expects to grow from 8,500 to 11,000 students over the next two years, and currently lacks the inventory for adequate student housing. The Foundry will be managed by Pegasus Residential, an experienced property management company with a 35,000-unit portfolio, including eight communities in the greater Augusta market. RADCO’s mission is “Building Better Living.” Based in Atlanta, the national real estate acquisition and redevelopment company was founded in 1994. The firm has grown its multifamily portfolio to include approximately 17,500 units in Colorado, Florida, Georgia, North Carolina, Oklahoma, South Carolina, Tennessee, and Texas. For more information, please visit https://www.radco.us. Founded in 2013, Columbia Ventures is an Atlanta-based real estate development and investment company focused on urban mixed-use campus development in the Southeast. Columbia Ventures often operates in public-private partnerships and is the sister company to Columbia Residential, the award-winning developer of affordable and mixed-income housing that was founded in 1991 by Noel F. Khalil. The company’s founders have extensive regional and national experience and have developed more than $2 billion of commercial real estate. For more information, please visit http://www.columbiaven.com.